Wirecast 7 is a well known input switching software tool that can assist users to switch between various captured sources on real time basis. It is also possible to add fades and transitions into streams while switching between various sources. The best thing to know about wirecast is that users can enjoy switching between unlimited input sources while working on computer. Using wirecast users can capture signals from IP camera, webcam, microphone, camera, capture card, pre made videos, from computer screen and images etc. iPhone 4S can be used as an input source for camera whereas live twitter feeds can be pulled on to broadcast platform. Some of the effective editing features include flip, rotate, position, crop and resize etc. and the best part is that it allows users to live stream on multiple platforms at same time including Churchstreaming.tv, Twitch, YouTube Live and Facebook Live etc. Wirecast Studio 7 with price tag of $495.00. Wirecast Pro 7 with price tag of $995.00. It comes with Facebook live integration facility. Offers simulcast choices for YouTube and Facebook. Users can integrate this platform with multiple input sources for easy sharing. It offers so many editing tools with advanced features so that users can enjoy interactive services. Users are not able to view live comments within program. Wirecast 7 is popularly used by professionals as well as beginners for Live Video Switching needs. Further, it offers abilities for titling, live keying and customization. People find this platform operational and flexible along with affordable packages that is why it is commonly recommended for beginners. OBS stands for Open Broadcaster Software that can record impressive videos from computer screen as well as from webcam. It can also work with whole window recording and one can also select specific portions from desktop screen for customized recording. Professionals as well as beginners love to use this platform for live streaming needs and one can also share content on various social media platforms using OBS. It offers interactive user interface with loads of advanced features. Videos can be easily saved into popular file formats like MP4 and FLV etc. It is capable enough to maintain rich quality of videos with reasonable file size. Windows consists of cleans and operational design. Users can add multiple sources to this platform and it is also possible to develop customized profile. It allows users to work for recording whole window at a time as well as selection portions of desktop. It is possible to tweak audio settings as per need. Users can access shortcuts to start and stop livestreaming. Audio signals can be captured from microphone and soundcard. 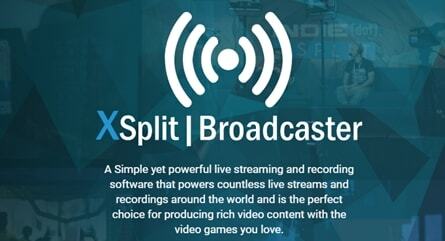 XSplit broadcaster is popularly used PC based application that was specifically designed for Window XP, Window 7 and Window Vista systems. It’s easy and interactive interface makes broadcasting fun oriented with lots of built in editing features. Professionals love to use this platform for video game broadcasting as well as for business applications. Some of the popular games that you will find on xSplit platform are Startcraft II, League of Legends, Minecraft, Guild Wars 2 etc. Users can set their own customized graphics for different videos and can add impressive backgrounds to make videos eye catching. Simple to use with interactive editing platform. Works effectively for video game broadcasting and can process heavy game loads easily. Provides impressive clarity for videos files. Supports all popular media file formats with reasonable file sizes. Can be used with webcam and desktop screens. Comes with wide range of packages that are well priced and useful for beginners as well as professionals. vMix software program allows users to develop professional quality productions on their personal computers and it is possible to add multiple sources for classic content integration. One can pick data from multiple cameras in form of audios, images, videos, web streams, chroma key, and virtual sets, titles, PowerPoint and many more. The end results can be easily shared on several social media platforms or live streaming networks. It is well known for its lighter interface that takes no time to get started. Much easier to upload files and it offers unlimited formatting options. The best thing to know about vMax is that it extends support to 4K video quality with breathtaking clarity. One can process videos on real time basis without making any compromise for fluidity. It supports all popular media file formats. Allows real time updates to social media platforms. It offers professional management for content to achieve best results. I was using their free version of Wirecast, and totally love it. Facebook Video with screencast feature is amazing. Planning to try their full premium version soon. Thanks for the write up Liza. (Y). Have a nice day. Robin.